How Misha tells a story! On Tuesday, Max, Misha and I attended the funeral of a 24 year old local soldier killed in combat in Afghanistan. Before we left I was talking with our children about this man and how he had died. This led to many different questions but the one that hit me hardest was this one; "Was he real?" This is a question I got from Annette, our 6-year old daughter. It was with this question that I realized that in many ways the thousands of soldiers who preceded Corporal Hovater in death were in many ways "not real." They were simply headlines in the newspaper or a story on TV to me. If you have never experienced the significance of a full honors military funeral please take the time to go. The 22-year old widow sitting alone. The grieving mother. The snap of the guns in the 21-gun salute. The playing of taps. The presentation of the purple heart. The carefulness and respect of every movement by the honor guard. The shielding of the family by the Patriot Riders. The WWII, Korean, and Vietnam vets standing in solidarity. The precise folding of the flag. The finality of a "real" person who truly gave the last full measure of his devotion. 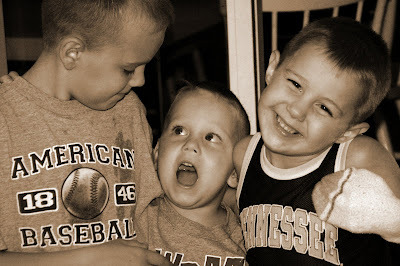 My boys asked so many questions and so many "whys." I wish I could have known Corporal Hovater in life but in death he taught both me and my sons incredible lessons on freedom, costs, and devotion. RIP in the arms of God! We had been quite concerned because there is a two phase recovery process that is used. With the boys we just did not feel this was the most therapeutic method for them emotionally. The mind of a hurt child processes things differently. Even though they probably wouldn't remember much from phase 1 we asked that we be brought in because these boys already have enough things they won't remember that will haunt them for a very long time. We are blessed to have Melissa's parents nearby so the girls stayed there Wednesday before surgery and Thursday after surgery. Coordinating two surgeons, five procedures, and three boys is a tough task but this was done smoothly by the staff. The boys were scheduled as the last patients of the day and we were able to be with them until they were wheeled into surgery and with them when they came out. With us having three groggy boys coming out of surgery we had Melissa's parents helping. The girls stayed with our friends Kathy Melquist and Heather McElhaney who were visiting from New York. All went smoothly. Max had a horrific experience with dental work in Ukraine and we were very concerned about this. He ended up needing all eight childhood mollers pulled. He has parlayed that into 8 consecutive nightly visits by the tooth fairy. Misha, our little sensory guy, did quite well. Misha loves to sing, has great rhythm, can dance and now has a great set of grilles after ending up with 5 crowns. Vitali had to have a recurring issue dealt with and he has been suffering the most. In recovery he peed on me and then threw up on both of us. The boys are all doing quite well now. We have been so blessed and continue to be blessed. When we decided to start this journey we were not sure "how" we could do it. The amount of money we have spent this last year has been staggering and we have done it without going into a dime of debt. I continue to be amazed by the generosity of so many people. I had two people approach me recently and gave unsolicited generous gifts and then Friday of last week after I had sent a $2,800 check for the dental portion and was ready to spend another $2,000 on Thursday to cover our deductible. A third person through some incredible circumstances told us she was sending a very large check that was just enough to cover both of these expenses. We did not share this need with any of these people much less the amount. "In the year that king Uzziah died I saw also the LORD sitting upon a throne, high and lifted up, and his train filled the temple. Above it stood the seraphims: each one had six wings; with twain he covered his face, and with twain he covered his feet, and with twain he did fly. And one cried unto another, and said, Holy, holy, holy, is the LORD of hosts: the whole earth is full of his glory. And the posts of the door moved at the voice of him that cried, and the house was filled with smoke. Then said I, Woe is me! for I am undone; because I am a man of unclean lips, and I dwell in the midst of a people of unclean lips: for mine eyes have seen the King, the LORD of hosts." I have always said this adoption was not about us and I can truly say it wasn't. That being said I have received so much from this journey. I understand life in a totally different light. I have seen the best and unfortunately the worst of humanity. I have learned to be much more empathetic. dump out the water left in his glass. Ivy wanted me to fall! Not taking ownership when things happen seems to be a common theme for Vitali and Misha but this latest one was a classic. Vitali had been standing on the recliner in our living room when he fell with a loud thud. Ivy rushed right over to help the wailing Vitali and was comforting him. When we asked Vitali what happened and how he fell, Vitali said "I was on that, and Ivy wanted me to fall, and I fell." Funny thing is, when I want Vitali to behave, he doesn't.